This is a great way to hide veggies if your little ones are not too keen to eat them! Pre-heat oven at 200C degrees. Cook pasta in large pot according to instructions on the pasta packet. Drain and keep aside. Saute onion and carrot with 1 TBSP of olive oil and a pinch of salt. Add to pasta and combine evenly. In a small saucepan, add flour to 1 TBSP olive oil, when the flour turn slightly brown, add milk a little at a time, whisk till you have a smooth sauce without lumps, add salt and nutmeg, half a cup of cheese. Mix well. Turn off heat. Add cheese sauce to pasta, transfer to a large baking dish, spread the remaining cheese to cover pasta, dot sliced ginger over. Bake in centre rack of oven for 20 minutes or till golden. Serve with salad. Notes... A fairly simple recipe. If you prefer to use the traditional tomato pasta sauce instead of cheesy sauce, go right ahead, it will taste just as delicious as this one. The preserved ginger adds a twist to the dish, and it will warm your heart on a chilly night too. Thanks for the recipe. I will replace the soy milk with normal milk. Just don’t like soy milk. I’ll be trying this tomorrow for lunch. Thanks for the recipe. A lovely cheese dish – many thanks. Of course you can. The idea of this recipe is to encourage the kids to eat more veggies. Please add more ingredients to suit you and your kids’ taste. Yep – agree! I add chicken and other ingredients to pasta meals. What a great way to hide vegetables. Well done. Sounds lovely with the ginger in it. Absolutely love simple vegetarian recipes! I’ll defiantly be trying this one out. Thank you MOM. Cheesy carrot mmmm that is different.. Looks so yummy too!! I’m such a carbohydrate junkie. This looks wonderful. I would definitely eat too much of it in one sitting though. LOL. I think you are not the only one who does that. If that’s your concern, just make quarter of the amount in this recipe so you have no worries in eating the whole portion that’s just right for one person. MMMM, this looks lovely and perfect for when the nights cool down. 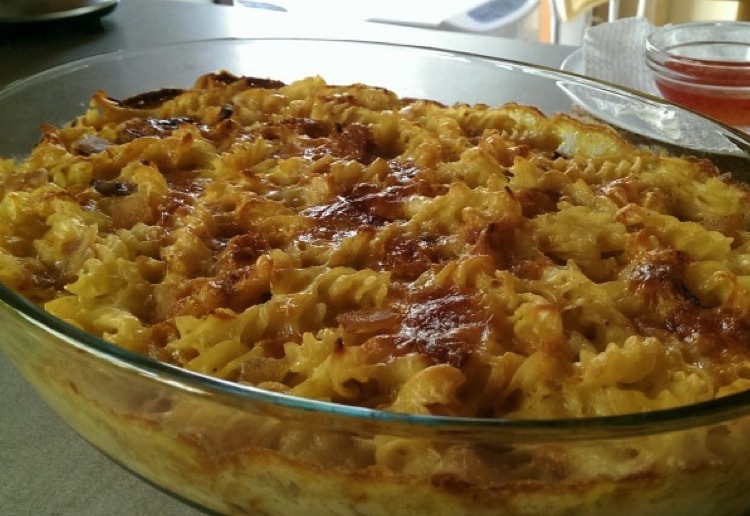 This baked dish is ingenious with great simplicity; the combination of ingredients, delicious!. Yum, looks delicious! Would definitely be a family favourite! Lovely pasta recipe,a new one that looks delicious! Thanks.